It’s almost 5:00 AM, and I am awake after a fitful night’s sleep. Driving here yesterday, I got super-sleepy around 4:30 PM, and stopped for a pick-me-up. I picked up a cold Blue Bottle New Orleans coffee, in a little half-pint container, and it was both incredibly delicious and effective, but too late in the day for a lightweight like me. Altitude didn’t help, either. But that’s fine–an early start and I’ll be assured of getting the itinerary I want for my wilderness permit. Sometime in the middle of the night, I heard a branch fall from a tree nearby and hit the ground hard. I imagined it falling on a tent, but I didn’t hear any screams, so I drifted back to my semi-sleep state. It was a good reminder to look around for those sorts of dangers before pitching a tent. Crescent Meadow, shining in the morning sun as I start my trek. I had a forced leisurely morning. I couldn’t get my permit until about 8:00 AM. Cost was $15, and I’m good to go. I ate a breakfast tea and a breakfast burrito at the Lodgepole market, and then drove down to Wuksachi Lodge to send my itinerary to Tom, so that someone would know where and when to start looking for me, should anything happen. There was super-slow internet there, and it took mealiest an hour to log on and send the message. Then back to Crescent Meadow and the start of the High Sierra Trail. It was nearly 10:00 AM by the time I got going. Hot, smoggy, so many dead trees. Out here, I am always aware of the life and death all around me all the time. Lately, it seems like Death is getting the upper hand. Poor trees! I balanced my iPhone on my trekking poles, which I leaned up against a tree, to take this photo with the timer. The sequoias are amazing! I’ll be leaving them behind for the rest of this hike, as I climb to higher elevations. At every little stream crossing, there were dozens of little monarch-colored California Tortoiseshell butterflies that flew up at my approach. I tried to take a photo of one with the wings open, but they were so fast, and uncooperative. Finally, I found a wounded one lying on the trail, and managed to get a photo. I saw 9 people on the trail all day. I was really dragging today, wondering why I “like” doing this. My pack is heavy, though I don’t think I’m carrying anything extra. I plodded along, looking out at the visibly brown air below me, feeling hot and cranky. My right shoulder is burning, my hips are hurting. Taking time to adjust my pack straps gives a certain amount of relief. Looking back toward the way I had come. That’s Morro Rock on the right side. The air is clearing up, but I am still walking past many dying trees. At Mehrten Creek, I rinsed the trail dust off, washed the sweat from my clothes, and now what? It’s early afternoon, still hot, and I am alone with my tent on a ledge above the creek. The deer flies are really getting to me! Luckily, they are super-slow and I can take some satisfaction in lessening the population by one every time I get bitten. I want a nap, though, and will have to cover up for it. It’s clouding over, it’s very buggy, and I am tired. I got ready for bed and got in the tent to get away from the bugs. It started raining as soon as I got in! Just little gentle drops, but it sounds lovely! Didn’t last very long, though. Afternoon thundershowers gather over the mountains. Today, it’s stormy where I’m headed. What will tomorrow bring? My little home on the trail. I just woke up from my nap. It looks nice outside. I emerged from the tent, ate some salmon and crackers, and inhaled a tiny piece of fish. I just spent about 20 minutes coughing and wheezing, trying to get it dislodged. I finally feel better, but I wonder what might have happened if I had needed a Heimlich maneuver out here all by myself. Luckily, I don’t need to find out. Now it’s 8:00, and I think I am going to go to bed for real this time. My phone tells me I hiked 8.82 miles today, and climbed 31 flights of stairs. Not too bad. No wonder I’m tuckered out! At least when you look out at the brown haze, you’re ABOVE it! You are amazing, Laurie. Safe travels to you. Thank you very much for the information on Nestle, our household buys *almost* nothing on that list, but I didn’t know that they own Friskies. Can anyone recommend good wet cat food? Our feline cohabitants are unhappy w an all dry food/kibble diet. Thank you for taking the time to blog your thoughts and travels, Laurie! Hi Laurie, careful with the salmon. Meat bees, aka, yellow jackets become aggressive. I once hiked 30 miles with a swollen hand. Also, only time Ive seen a short tailed ferret, was when I pulled out salmon for lunch along a stream at 10,000′. Whoa! The chance of seeing a ferret is a good reason to brave the yellowjackets! Laurie, I am reading your reports with great interest. Thanks so much for sharing your experiences and thoughts. As for that insidious Nestle company, I appreciate your sending info. on their huge number of products. We try to avoid them, too. I have ever since Nestle was pushing its baby formula (thus discouraging breast feeding) in developing countries. That was years ago. Now Nestle is trying to bottle spring water from near Cascade Locks (in the Columbia River Gorge). Fortunately there is lots of opposition. Wonderful highs and lows of your solo Laurie. 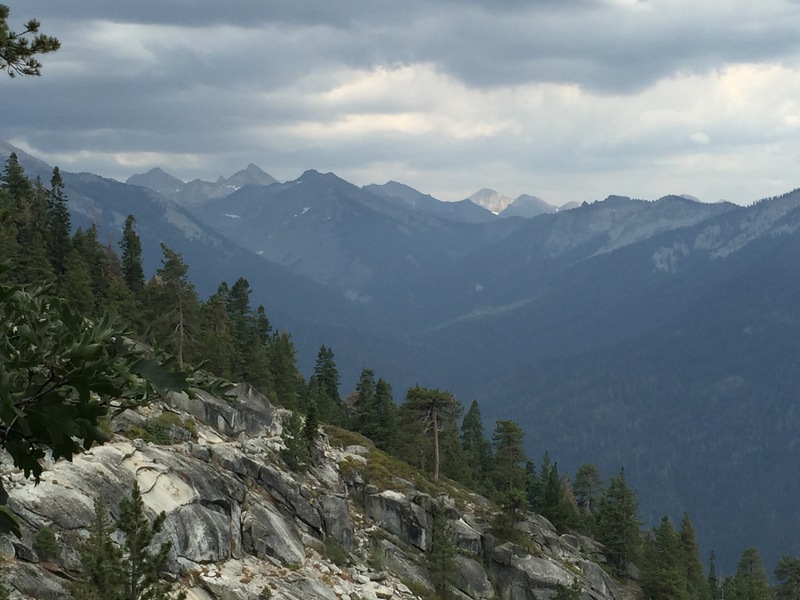 This blog takes me there, into that deeper place of taking to a trail solo. Time is measured differently, as is your space. Enjoy and blog-on! Laurie, it is so awesome that you did this!! I look forward to reading all about it!